Talking about falls and we cannot miss the name of Niagara right?? Of course, if anyone is asked about biggest or highest waterfall of the world, and the answer will be Niagara in most of the cases right? 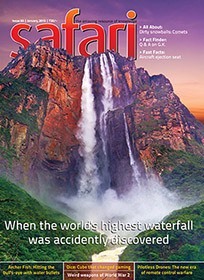 The themed article of this issue is about the world’s highest waterfall, but, it is not about Niagara falls!!! You got to read the article to know some strange facts. How it is named as Angel and how accidentally it was found is explored nicely by the writer Sushil Bhatia. Two generations and an aircraft are associated with this waterfall in many ways. Exploring these details gives you feelings of exploring a thriller tale. The cover page contains the photograph of the same fall. Parent-child love is one of the best to be found. The photograph showing a a juvenile Eurasian spoonbill put it’s beak inside parent’s mouth to receive food, in megapixel section is a high resolution photo which makes you emotional too. Seems this issue is en route to explore a lot of natural stuffs. Talking about the nature oriented articles and we must mention the article about comets under the title “Comets: The wandering ghosts” gives really almost everything you want to explore about them. We consider – the editorial – as one of the most important segment of any magazine as it links the editor and the reader. It also gives readers a chance to explore the vision of the editor and let the editor share his/her message to the readers. So it is a two way communication channel in one way. We miss this segment in this issue and consider it as a downside. The article about Netherlands brings us a lot of factual information about the country we don’t know. It includes the information about the fact that a lot of the area of the country is below sea level!! It is also prone to floods and losing land to the sea. The people there are continuously finding the better ways to fight against these facts. It resulted into some of the engineering marvels of the mankind. Don’t miss this article to know interesting things like, how people there used to make homes on the mountains to avoid losing them to floods, and how eventually they have linked the mountains through walls; giving them the connectivity and keeping the water at bay! We feel, a single page article is not enough for the topic and wish to see a detailed article in future issue. Ilyushin-38 is one of the good weapon in India’s arsenal. India is having about 7500 KM long coast and it requires really remarkable efforts and resources to secure it and keep an eye on it. Ilyusin-38 thus plays a very important role. The illustration about it’s functioning is a positive aspect of the small article. Another article about India’s armed forces is about INS-Vikrant. INS-Vikrant happens to be India’s first (and even Asia’s first) Aircraft career. It played important role in the battle of 1971 as well. It is officially retired from the service years ago. Later it was converted to a museum and was a source of inspiration for the visitors. Eventually the cost to keep it functioning as museum became higher and higher; even the proposal of considering it for training purpose didn’t work out. The government have tried asking for proposals to some of the capitalist to raise a helping hand in maintaining it, but it is not responded.Ultimately it is sent to the ship breaking yard, and is now passing through its last days! Can’t we raise fund from public to keep such stuff as a monument?! Some of the stuff are weaved in our lives so routinely, that we even don’t think them as a special stuff. Take an example of band-aid. It was an accidental discovery!! The small article about it is worth reading. What is common in Ludo, Snakes and Ladders and Monopoly (apart from being games, of course)? They all are played with dice! Do you think you can have an article abut dice? Yes, this issue have it. And it is very interesting article. Despite from giving facts like several countries like Japan and Korea even uses Black dies! ; the article also brings images of dice used in Egypt and Bar-shaped dice from India too (These images are not there in Dice article at WikiPedia). There are fake dice(!) and ways to find it. We didn’t knew that the sum of the figures in opposite side is always 7 in an authentic dice!! There are much more information you don’t like to miss from this article. D N Kaushik authored a nice article about “flying lizard” in this issue. The article discusses about the lizards which can run on water! You may not believe it without seeing images! This National geographic article is a good read in the same regards. To survive any of the species need the ability of either to run or fight. Do you know that there is a fish which can fire the bullet of water drop like an arrow and it is able to hit the “bull’s eye” and hence known as “archer fish”. Harshal Pushkarna’s article about “archer fish” is nicely written and contains good images. The article also talks about he science behind the fish’s ability to judge the target in different medium (from water to air). It is “not to miss” article. Ejection sits are necessary in combat airplane. It serves the purpose of the final tool of escape in emergency for the pilot and co-pilot. The – Fast Facts – segment brings some factual information about the same. Nowadays we are hearing a lot about pilotless drones. They are creating a new era in war-zone. The pilots are fighting by controlling the drones with remote control by sitting in a room. An article about Pilotless drones is also there in this issue. The article is studded with some rare photographs (like how “man”ual was the bomb dropping in World War era). Ravindra Acharya’s remarkable searching for the information efforts are seen in the article. It has very good illustrations which explains the functions of “Predator” very well. One more article in the magazine worth talking is about some of the strange weapons used in World War 2. To avoid spoilers we will simply give you the names of such weapons, and you can find more details in the magazine itself. Live bombs made of dead rats. Why are the blood vessels of a body builder visible swollen? How do anteaters manages to fulfil it’s bodily needs by feeding on tiny ants? Female mosquitoes are known to feed on human blood, but what do the male mosquitoes feed on? What happens inside an internal combustion engine of a car when the accelerator pedal is depressed? What is the force that throws away a person in the event of an electric shock? How does a later ray cut through tick sheets of metal? Apart from India, which other countries have major population of Hindus? Is there a special train for use by the President of India? How does the economy of the world’s smallest country – the Vatican City function? What is a smart bomb? How is it different from an ordinary bomb? Why does the national anthem of India has reference to “Sindh”, which is actually a province of Pakistan? It is one of the best value for your money and time spent to read, magazine issue. Do not miss it. Don’t forget to read our review articles for the previous issues of Safari; we are sure you will enjoy reading them.